Registration for the Spring Giveaway Season is Open!Treephilly Registration for the Spring Giveaway Season is Open! Registration for the Spring Giveaway Season is Open! The spring tree giveaway season is upon us! This season, we are trying something a little different. While we will be hosting one city-wide giveaway and a few popup events, most yard trees will be given away at community-hosted events throughout the city. So you can register for our signature event at Cobbs Creek Community Environmental Center on April 14th below, but if you are interested in something a little closer to home, check out all our community partners, listed here. Use the links below to contact community groups directly and ask about their yard tree giveaway. I was wondering if there is a place in the Roxborough or Manayunk area the zips are 19128 & 19127 respectfully. 2 years ago I had a beautiful tree planted on my pavement. And was just hoping there would be one around me so I can also have one in my yard. We do not have any yard tree giveaways in Roxborough/Manayunk this season. 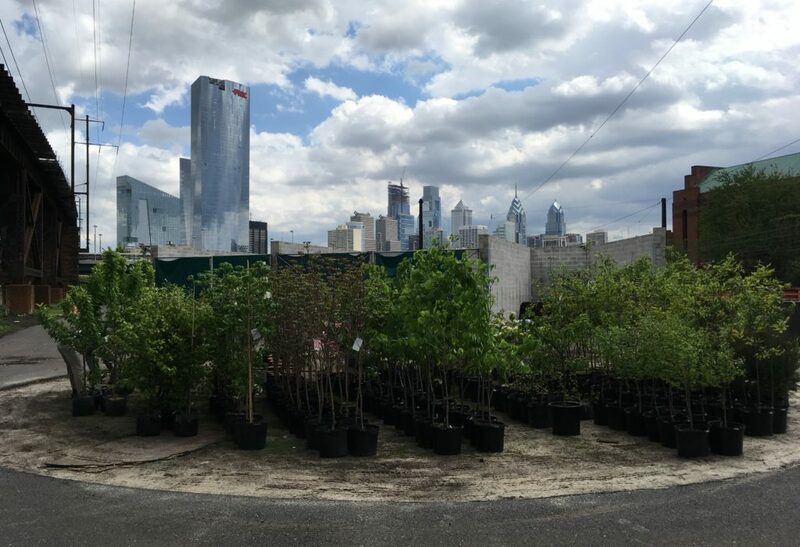 But you are welcome to register for your city-wide yard tree giveaway at the Cobbs Creek Environmental Center, or at one of the community giveaways closer to you. To do that, visit a community group’s website via the link on their website and contact them with the information you find there letting them know you would like to register for a yard tree. Please note that these trees are to be planted in the ground in a yard, not the street. Hope to see you at one of the giveaways! I too would like a tree giveaway in Roxborough or Manyunk! Not enough tree cover in this area aside from Wissahickon park. Thanks for letting us know! Hopefully we’ll have more applications from those neighborhoods for our Fall series of Community Yard Tree Giveaway Grants! You can register right now! Visit the community group’s website via the link we’ve provided on our events list. Use the information you find there to reach out to the community group and let them know you’re interested in registering for a tree. TreePhilly does offer planting assistance, in the case of disability or limited mobility. Here is a form for assisted planting. If it pertains to you, please print and fill out this form, and mail it to us. We have one citywide event this year, and the rest of our events are hosted by community groups. Unfortunately, no community groups from Fox Chase applied to host a giveaway. But we have a total of 5 giveaways in Northeast Philly which you can find out more about on our website. You can email or call the Polish Home via the contact info you find on their website and let them know you’re interested in registering for a yard tree! You can register by emailing Diane at danutam@comcast.net! I would like to plant a tree, and be a part of making Philadelphia beautiful and green. I think this is awesome way to spread the go green movement. Glad to hear that, Mitch! Feel free to register for our signature event, or reach out to the groups hosting community giveaways and let them know you’d like to register. Where do I see the types of trees available? Can some of these trees be potted, or are they all meant to be planted in the ground? All of the trees TreePhilly provides MUST be planted in the ground to reach their full potential, and it is unlikely that any of our trees would survive in a pot, no matter how large, for more that 3 years. So be sure to plant in the ground! How large are the trees we’ll be picking up? I’ve register for the Franklinia. Want to make sure I come with an appropriate vehicle. Franklinias will not be very big, only about 4′ tall. So a sedan with the seats down would be plenty of room. Will we know in advance the types of trees that’ll be available? Do we have any choice in what we receive? Will the selection vary significantly from one location to another? You can ask the community group whose giveaway you are attending which trees they will have available, and the types of trees will not be very different across the different events. It is up to the community groups hosting the giveaways whether you can select the tree while you pre-register, but you usually can. Hi there, I am unable to register for the Heinz Refuge giveaway. Do you know when this will be up and going? Thanks! Hi Suzanne, Arbrew Day is Friday, April 20th, from 5PM to 8PM, at all locations listed. Also, there is no pre-registration for Arbrew Day! It’s mostly an event for staff and patrons to pick up the trees we have available at that time. So if you find yourself at one of the places listed, you may be able to get a free tree, but there is no guarantee you will get your first choice of species. Hi Andrew, Unfortunately all the Pawpaws are spoken for! Maybe consider an apple tree if you’re interested in fruit, or a sassafras if you are looking for a tree with a similar form as Pawpaw. Hello, I am very interested in getting a tree for my rowhome in brewerrytown. The only thing is that my front walk is all concrete. Would i need to have that dug up first, or could i apply for that kind of assistance? thank you! It sounds like you are actually interested in getting a street tree, which you can have planted for free by the Street Tree office here at Philadelphia Parks & Recreation! They will also remove the sidewalk in order to plant the tree. You can get more info here. Ate there any oak trees available at any of these locations? There are currently several willow oak trees still available to register for at our signature yard tree giveaway event at the Cobbs Creek Community Environmental Center on Sat. April 14th! I am unable to determine where the following two giveaways are being held and how to register: 04.22 Holmesburg Civic Association with the Insectarium. I went to both website and neither have any information. I he Frankford CDC will have a giveaway on 05.05 but no information on their website. Thanks for you help. Use the contact information found on their websites to contact them directly! Hi. I’m in Mt. Airy (Chew & Upsal area) and so interested in getting a free tree. A crepe myrtle to be precise.. Might this be in the inventory? We do not have crepe myrtle this season, but we do have white fringe tree, franklinia, witchhazel, eastern redbud and crab apple, which are decent alternatives. Contact the community groups hosting giveaways in north and northeast Philly to see if they have any available for you. if there is a place in lower merion area. I was just hoping there would be one for non-Philly resident. so I can also have a tree in my yard. TreePhilly only provides trees to Philadelphia residents, but maybe you could get a tree or get directed to another program through the Lower Merion Shade Tree Commission. Their number is 610-649-4000. Check out some local nurseries for a larger variety of more mature trees also! Yes this is something a bit new! Since this is a community giveaway, you will not receive a confirmation letter from TreePhilly, but you can contact Frankford CDC at any time to check on your registration status, and we have suggested to all community groups that they remind their participants to pick up their trees a few days before the giveaway takes place. Do we need to provide proof of residency when picking up a tree? No need to bring proof of residency, just bring yourself and any confirmation materials you received when you registered! Hi, I believe the closest event to me (East Germantown) is Frankford. I can’t seem to find where to sign up for it. Help? Thank you. A giveaway which is a bit closer to East Germantown, on May 9th, is at the Wyoming branch library in the Feltonville neighborhood. The giveaway is hosted by Esperanza, and you can email gpaez@esperanza.us to let them know that you would like to register for a yard tree! I called the numbers that you gave me to call about pruning the tree in front of my house but it rang and rang…not even an answering machine!!!!! It’s 5 yrs (2013) since I got the first letter saying they would be around to prune it…do you think it’ll be much longer?? Thanks for reaching out! It seems the tree you are asking about is a street tree not a private yard tree. At TreePhilly we work only with yard trees on private property and we do not organize pruning. But we can point you in the right direction! To get an update on the status of a street tree request you have to contact the Street Tree office at 215 685 4363 or 215 685 4362. I was wondering if you are going to have any more giveaways this year? I am very interested in getting a couple of PawPaw trees and I was either hoping to get one from you or from a local partner. Could you tell me where I could look? Of a local nursery where I can get them? We only have one event left this season as the Wyoming Free Library Branch from 5 to 7:30pm on Wednesday May 9th through our community partner Nueva Esperanza. You can contact our community partner who is running the event at (215) 324-0746. Ask them directly if they have Paw Paws left to register. As for nursery recommendations, because we are a city program it is a conflict of interest to endorse specific businesses, but we recommend reaching out to the Philadelphia Orchard Project for their thoughts! of it and I have you book-marked to see new stuff on your website. I would recommend updating your browser or using a different browser to load the site. It has been tested on our end with Google Chrome and Firefox.